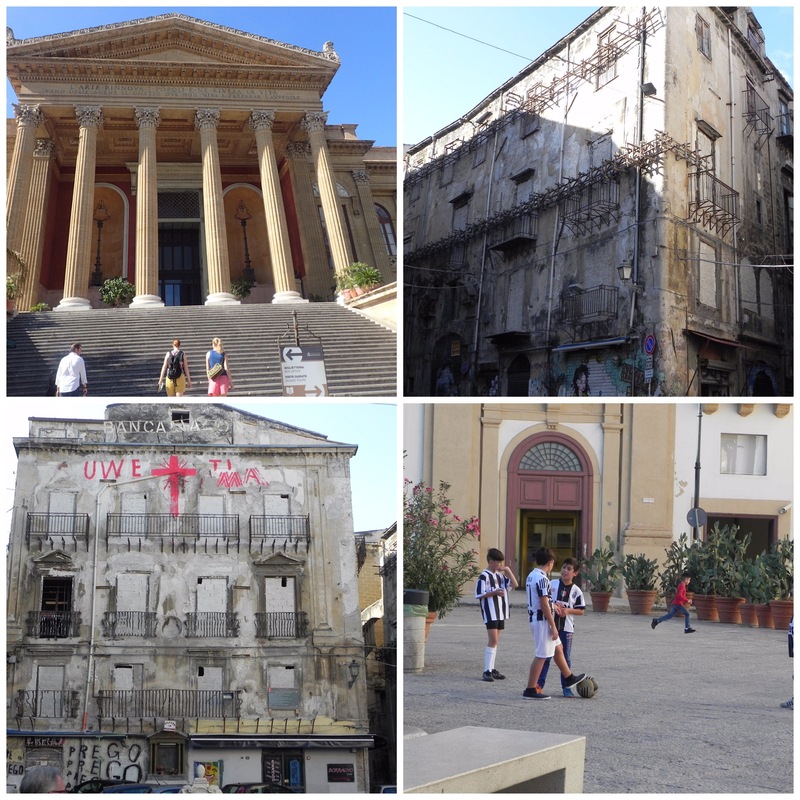 Palermo is a hard city to categorize. Our first impressions of the city on a Sunday afternoon were very positive. 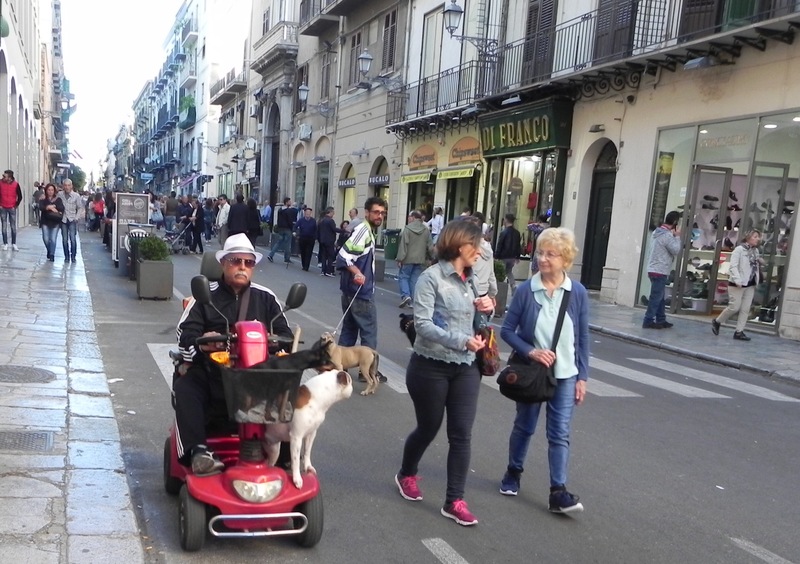 If a million plus people live in Palermo, at least half of them were out doing the passiegetta, the long, slow stroll Italians everywhere do to see and be seen. 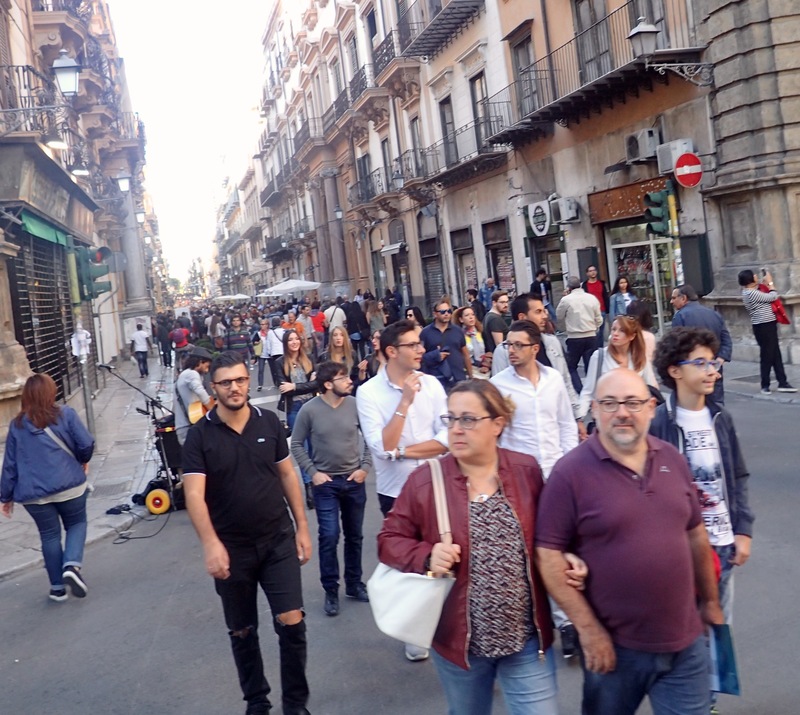 Palermo closes one of its main streets, Via Marqueda, to traffic for a kilometer or more. Just pedestrians, and a random bike or Vespa or two. Groups of teenagers, elderly couples, families with strollers. Folks walking their dogs. About every block or so a street musician, including a skinny blond singing Elvis’s greatest hits. Lively and crowded, it reminded me of a carnival or street fair. Monday morning showed a more subdued town and much more of the dust and grit Palermo is famed for. The old historic part of town is relatively small and imminently walkable. But Palermo is not a provincial Rome, despite the Roman, Norman, and Arab history. There doesn’t seem to be separate sections of town — either a “good” or tourist, or run down neighborhoods. All are mingled together. We wandered from one street corner to another, never knowing what we would find around the bend — derelict buildings, a street of cafes, or a magnificent palazzo or church, or kids playing. We had heard Palermo described as the litter capital of Europe. And while we saw a few informal garbage dumps in the countryside, and some dried up fountains were used as garbage receptacles, the capital didn’t strike us as any more littered than any other densely packed city. In fact, better than some we’d seen. More graffiti perhaps. The piazza around the opera house seemed to be the center of the city and a hotbed of activity. Prince Albert of Monaco arrived one afternoon with an entourage and a long motorcade. 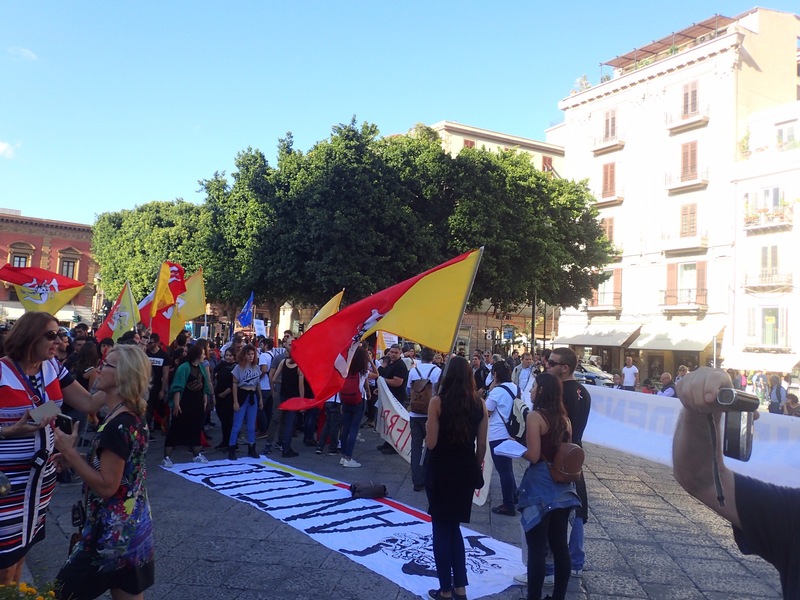 The next day, protestors assembled, complete with Sicilian flags, banners and a sound system on a shopping cart. We took a lot of pictures. Speculated about the issue. Sicilian independence? Anti mafia? Political party march? Finally, we asked a young woman and she explained it was an environmental protest — objecting to the burning of garbage by the local provincial government. Okay. Would never have guessed that. There were almost more police than protesters. And plenty of police cars and paddy wagons for hauling away unruly enviros. Never saw anything to justify the concern. This city was heavily bombed during World War II. Signs marking how historic buildings were damaged & repaired only referred to the war by date, “heavily damaged by bombs in 1943….”. As a result baroque era churches or seventeenth century buildings stand next to modern boxy apartment complexes. 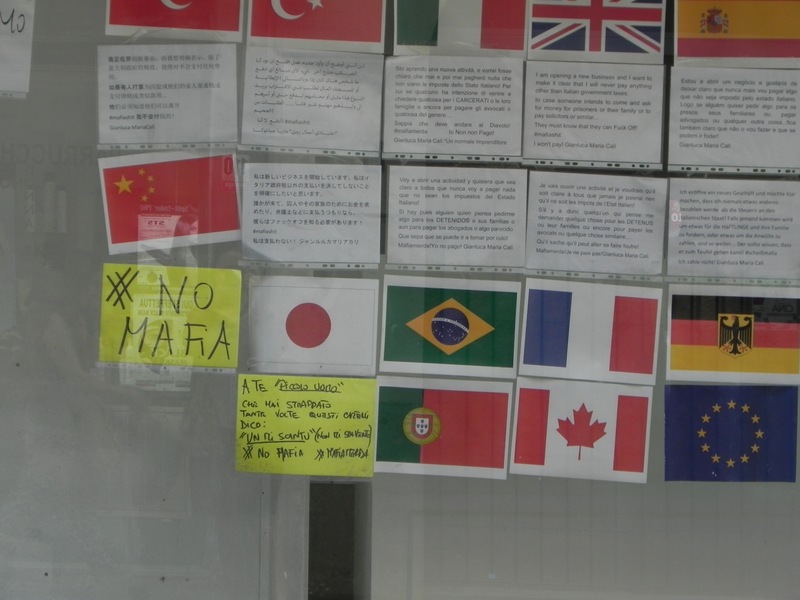 We saw several signs posted in storefront windows, saying “No Mafia” plus there are a couple shops that only sell local goods & foods produced by folks who won’t pay protection money. Of course, aside from what we’ve read, and most of that says the mafia has been marginalized, we’ve seen no indication of any criminal activity. Except as we snapped pictures in front of a grand local municipal building, an old guy walked past us and said very clearly to us, “Palazzo di Mafia”. The streets markets in Palermo are pure Sicilian. Hawkers shouting they offer the best fish in Sicily or the freshest produce in Palermo. Swordfish, squid, lobster, eels, beef sides, pigs’ heads, every kind of sausage and cheese, tomatoes, summer squash and green cauliflower, olives, spices, and much more. The air smelled of the fish, but also curry, citrus and spices. Messy, crowded and loud. 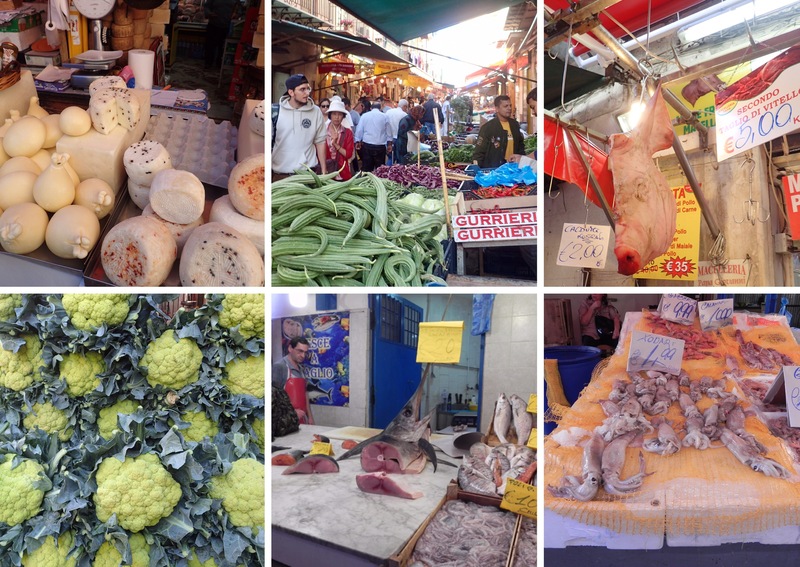 But filled with more locals than tourists, the markets clearly are part of life here in Palermo and the other bigger cities of Sicily. Of course, there are grocery stores, mini-marts, too. But in small towns like Trapani, we saw residents buying their produce & fresh fish off trucks stationed around the city. 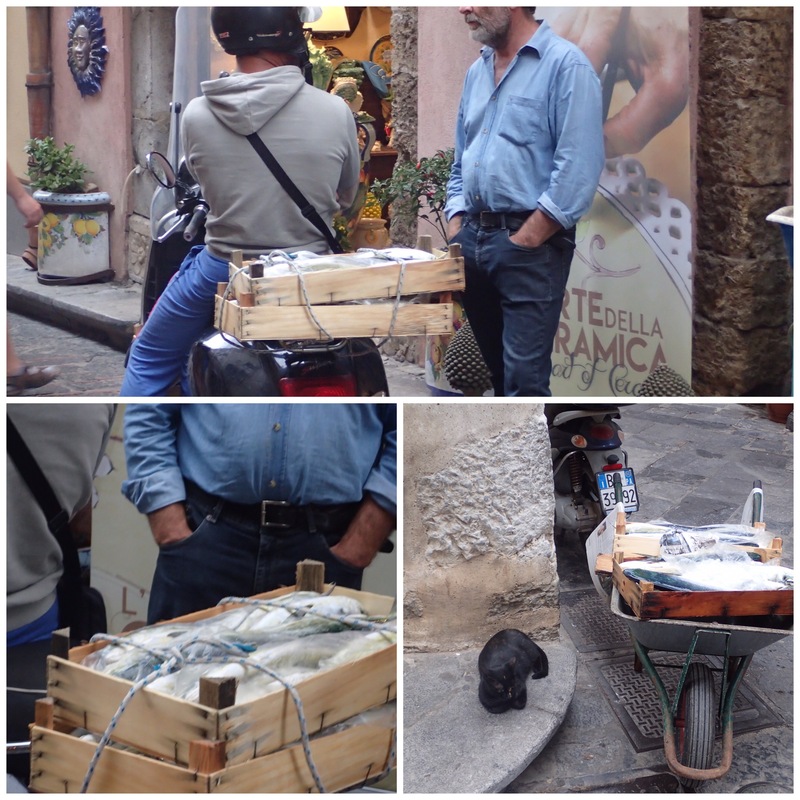 Or the fish was sold out of a wooden box on the back of a bike as we saw in Cefalu. Outside the historic district, Palermo may be a very different place, just as the suburbs differ from the hearts of Rome and Paris. 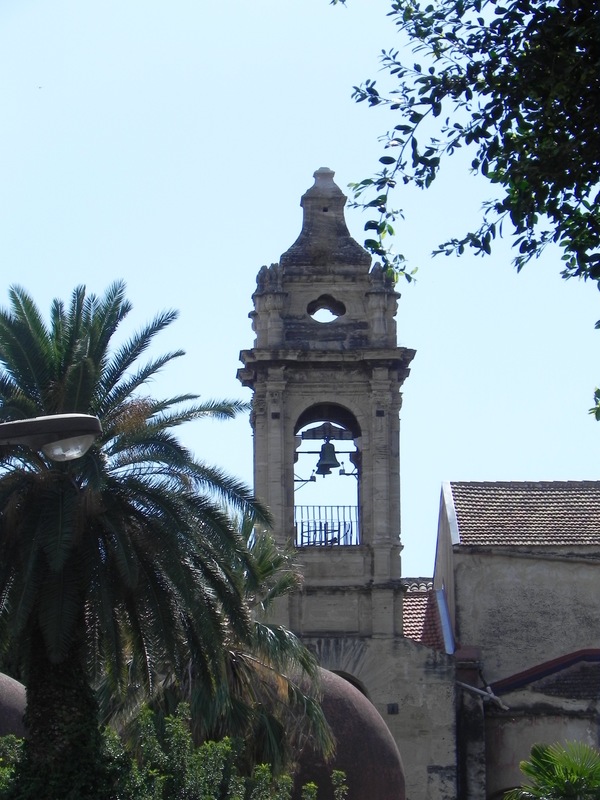 Old Palermo is a mixed bag, but definitely worth a visit.